A look back at transportation modes throughout history tells us that when using new technology is left to humanity, moving from one place to another can bring joy or pain. The horse could carry someone coming back to see their family or someone to conquer their homelands. A plane can bring needed supplies like the Berlin Airlift or drop bombs bringing devastation as the world saw at Nagasaki and Hiroshima. Civilization has sought to contract space and time so now a person or country’s military can move across the globe in a few hours or days. Driving across a country also gives the passenger a different perspective than say flying and looking down at the same landmark or land mass. Driving and stopping makes the experience more personal while flying and looking down presents someone with a spectacular view but distant. Two perfect examples of two different personal experiences are flying over the Mississippi River or the Grand Canyon before landing at the Las Vegas McCarran International Airport. The two land marks look awe-inspiring from your window seat in the airplane but seem are breathtaking when driving and seeing them up close, especially when you consider where you cross the Mississippi River. Let’s compare are primary ways to get from point A to Point B. 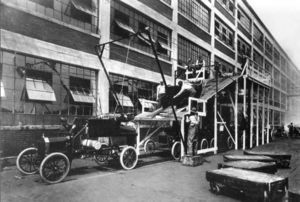 First True Automobile (Internal Combustion Engine) 1885/1886 (Karl Benz) 1804-First Steam Locomotive for the road hauled freight in Wales 1903-Wright brothers achieve sustained flight flying a properly engineered aircraft in NC 4000BC-First sailing boats built from reeds in Egypt. Steam Engine Auto (1769) 1825-The Stockton and Darlington Railroad company hauls freight and passengers over 9 miles using George Stephenson steam locomotive for tracks 1904 First airplane maneuvers (Turn and Circle) Wright Brothers) 1000BC-Vikings build long ships using oarsmen. Electric Carriage (1832-1839) 1826-Col John Stevens demonstrates the feasibility of steam locomotives on experimental track in Hoboken, NJ. 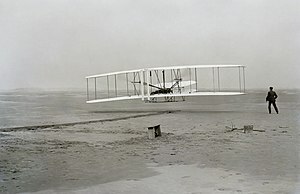 1905 First Airplane Flight over a half hour (33 minutes, 17 seconds) Orville Wright 1100AD-Chinese build junks with watertight compartments and strong sails using a rudder to steer. 1876-1895 George Baldwin Seldon combine internal combustion engine with carriage 1857-George Pullman invents the Pullman sleeping car. The first comfortable overnight sleeper. 1910- First licensed woman pilot. Baroness Raymonde de la Roche who learned to fly in 1909. 1819-First Steam ships used to cross Atlantic using steam and wind power. 1921-Italy constructed first limited access road (Auto Strada) 1932-German Bonn-Cologne Autobahn Constructed, 1922-First Blue Print for US National Highway System, 1956 The Federal Aid Highway Act allocating funds for extensive US Highway System. 1862-President Lincoln signs the Pacific Railway Act authorizing the construction of the first Transcontinental Railroad 1929-First blind flight using instruments. Took off and landed using instruments. (James Doolittle) 1811-First steamboat used on Mississippi River. 1938-1940-Merritt Parkway opened as first US fully controlled access parkway (Barrier Toll Plazas) from Hartford to New York City. 1869-The Central Pacific and Union Pacific meet at Promontory Summit, Utah for the driving of the Gold Spike. 1932-First woman to fly transatlantic solo. (Amelia Earhart) 1900-First cruise ship, the Prinzessin Victoria Louise, built for the Hamburg America Line, begins moving passengers using 120 first class cabins. Most people have a favorite way to get to their destination. What determines the final decision? A fellow traveler bases where to place his soul thinking about several factors–time, money, convenience and the fear of travelling by certain modes. Phobias can play an important role when travelling, sometimes more than funding. Beyond a person’s individual preferences, the comparison chart above shows that each form has benefited from the creativity, intelligence, courage, sacrifice and fortitude of many people to arrive where we are today. Other Modes: Walk, Jog, Bicycle, Tricycle, Motorcycle, Scooter, roller-skate, inline skate, Skateboard, escalator, surfboard, swimming, snowmobile, four-wheeler, Riding Lawn Mower, Farm Tractor, Public Bus, Horse, Camel, Llama, Oxen, Donkey, Mule, space shuttle, space capsule, hang gliders, trolley cars. Bridges are, and will continue to be, the original information super highway. Whether spanning long distances or a few hundred feet in length, a bridge connects people, towns, cities, cultures, industry and commerce. There is something remarkable about crossing a wide river like the Mississippi to get to a destination. They are monuments to mankind’s ability, courage, and engineering skill. The following post features two well-known and visited bridges. The Brooklyn Bridge was completed in 1883 and connects Manhattan and Brooklyn, New York. The bridge’s main span is 1595.5 feet and was the longest suspension bridge when completed. John Roebling, a German immigrant, and bridge designer and engineer, began work on the project. He sustained an injury while conducting surveys resulting in an amputation that developed a tetanus infection that eventually killed him. 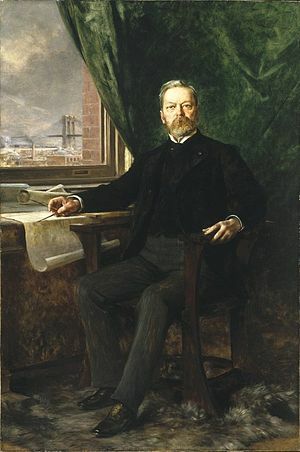 His son, Washington Roebling, continued the project. Unfortunately, Washington Roebling sustained a paralyzing injury himself due to decompression sickness soon after the construction phase began on Jan 3, 1870. What is fascinating about the construction is that Washington Roebling’s wife, Emily Warren, stepped in to act as a liaison during construction. Washington Roebling was incapacitated so Emily Warren communicated engineering plans to the staff building the bridge. Under Washington Roebling’s guidance Warren communicated strength calculations, catenary curves. bridge specifications, and cable construction designs. She assisted her husband for the next 11 years. chamber was pressurized so that water and debris would be kept out. They didn’t know enough about how pressurized air affected a person’s internal organs upon ascending to the surface too quickly. This is what is known today as the “bends” when too much gas forms bubbles in the bloodstream. Many were killed or injured during this process. These workers were known as “sand-hogs” and earned $2 a day. However, despite the dangers, they stuck with the process. Once they cleared away the debris and reached the bedrock, they started the process of laying the granite for the towers that were used for the suspension cables. Roebling built the bridge so that it would be six times stronger than needed. It is one reason the bridge is still standing today after so much vehicular and pedestrian traffic. 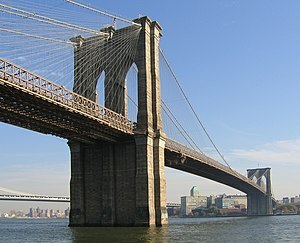 The Brooklyn Bridge was opened for use on May 24, 1883. On first day for crossing 1,800 vehicles and 150,300 people travelled between Manhattan and Brooklyn. Emily Warren Roebling was the first to cross the bridge. Emily Warren Roebling died of stomach cancer in 1903. Washington Roebling died on July 21, 1926. He fought the effects of caisson’s disease the remainder of his life.. According to historical documents, the steel used in the construction of the bridge was manufactured by Bethlehem Steel in plants in Trenton, New Jersey and Sparrows Point, Maryland and in plants in three Pennsylvania towns: Bethlehem, Pottstown, and Steelton. The steel was sent to Philadelphia and shipped through the Panama Canal to San Francisco. The construction design relies on cable suspension that passes through two main towers. The weight of the roadway is hung from two cables that pass through the two main towers and are fixed in concrete at each end. Each cable is made of 27,572 strands of wire. There are 80,000 miles (129,000 km) of wire in the main cables.The bridge has approximately 1,200,000 total rivets. Engineers working on the project used a “deflection theory” design that reduced stress by transmitting forces through suspension cables to the bridge towers. The project cost more than $35 million. The project was finished by April 1937 and came in $1.3 million under budget. The color of the bridge is officially an orange vermillion or international orange. Since 1990 acrylic topcoats have been used for air-quality reasons. The program was completed in 1995 and it is maintained by 38 painters who re-paint the areas where it becomes eroded. Both the Golden Gate and Brooklyn Bridges are majestic when viewing or crossing over them. The workers who died while making these structures deserve to be remembered. The talented engineers and hard-working construction people who completed the bridge also deserve a “job well done!” from each citizen who walks, rides or travels across these bridges. What are your names of your favorite bridges? Leave a comment and let me know.